If I write, "I just saw the new film, 'La La Land,' with Emma Stone and Ryan Gosling," does it sound like I actually saw it with them? Or ... "I just saw 'La La Land,' the new film with Emma Stone and Ryan Gosling." How about I just stand on a rooftop and scream out, "LA LA LAND!!!!" You will still get what I mean. The film is intoxicating. Enchanting. Soaring and romantic. It is the perfect Trumptidote in these troubling times. 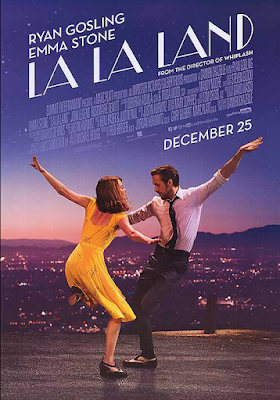 The song, dance, liveliness, fantasy, cinematography, and storyline bring back Hollywood films -- like "American in Paris" (1951), "Singin' in the Rain" (1952), "Guys and Dolls" (1951), "High Society" (1956), "West Side Story" (1961), "My Fair Lady" (1964), "Mary Poppins" (1964), "The Sound of Music" (1965), "Grease" (1978) -- that lift our spirits. Click here for the "La La Land" trailer. Now click here to purchase tickets at a movie house near you. Get ready for Hollywood magic and abracadabra. This, kind readers, is the kind of film that makes America great again. I couldn't agree more. This movie is such a sweet, lovely breath of fresh air—a deliriously delicious escape from the dark and troubled times we are living in, especially as we approach the dreaded inauguration. You will we swept away by the kind of romance and cinematic magic we haven't seen since Hollywood's golden era. If you love watching old movies and yearn for the romantic swoon of a Frank Capra film, stop whatever you're doing and go see this "picture" pronto. Ryan Gosling has all the down home charm of Jimmy Stewart, plus the tough guy sensitivity of James Dean and when Emma Stone sings her heart out, it brings to mind a young Judy Garland singing"Somewhere over the rainbow" or perhaps Natalie Wood singing "Somewhere." I predict this movie wins big at the Oscars and perhaps heralds in a new genre in filmmaking. Enough with the mind-numbing action films and the cynical plots that shock and disturb us ad nauseum. It's time to enjoy going to the movie theater again. Come on people, let's dance! Palmer Davis, thank you for this delightful and thoughtful comment about "La La Land." Yes, let's get back to films that transport us back to dancin' and romancin'.